Coach Jimmy Goebel and his Norris City-Omaha-Enfield Junior Cardinal basketball team welcomed the Fairfield Colts to town Monday evening for the championship game of the SIJHSAA Class M Regional Tournament. Although this would mark the third meeting between the two teams with the Junior Cardinals coming out on top in each of the previous meetings, everyone is well aware that it is tough to beat a team three times in a season. First quarter action found the Colts striking first to claim the early 2-0 lead, but NCOE would tie the contest at 2-all. At this time, the momentum shifted to Fairfield as the Colts started knocking down every shot they threw up. This would enable Fairfield to go on a 13-5 run and claim the 15-7 first quarter lead. The second quarter would once again start out slow for the Junior Cardinals, but as the quarter progressed, the NCOE defense would pick up forcing some Colt turnovers. NCOE would use this to their advantage and go on their own 14-10 run to cut the Colt lead to just four points, but a desperation shot would go down for the Colts to extend their lead back out to six points as halftime arrived. When both teams hit the floor in the third quarter, action was very intense with both teams showing lots of drive and fight. NCOE would manage to fight back and tie the contest at 30-all, following two made free throws by Preston Long. Fairfield, however, rallied to take the lead back, and the third stanza would close with the Colts claiming the 36-33 lead. The Junior Cardinals still had a lot of fight left in them and their determination started to show in the final frame of action as they narrowed the Fairfield lead to a mere two points. At this time, Cord Tucker would knock down a jump shot to put NCOE up 37-36. The Colts would promptly drain a shot from behind the arc to jump in front once again at 39-37. NCOE attacked again when Tucker drove and was fouled. Tucker would then converted both free throws to tie the game once again at 39. Erik Healy then jumped into the passing lane to collect a steal and convert a layup, to put the Junior Cardinals back on top 41-39. After a Fairfield miss, Tucker would drive again and collect another foul. Following another free throw conversion, NCOE would cling to the 42-39 advantage. Both teams then traded baskets and the Colts would cut the lead to one point, but two more free throws by Long allowed the Jr. Cards to stretch their lead back to three points. This shrank back to one when the Colts converted two from the charity stripe to only trail by one. Joel Hortin would then drive to push the Jr. Cardinal lead to three, but the Colts returned the favor with a drive of their own. With less than twenty seconds of play remaining, the Colts were forced to foul, at which point Long would go to the line and make one of two, to leave NCOE clutching a two point lead with less than 10 seconds remaining. Fairfield was working the clock and looking for the win or the tie, but out of nowhere, Jaden Simmons would step into the passing lane and swipe the ball and drive to the basket, where he would get fouled. Simmons hit the first free throw, giving NCOE the 48-45 lead. Following a Fairfield timeout, Simmons would once again step to the line and add another point to the Jr. Cardinal lead, sealing the victory with just 2 seconds remaining. 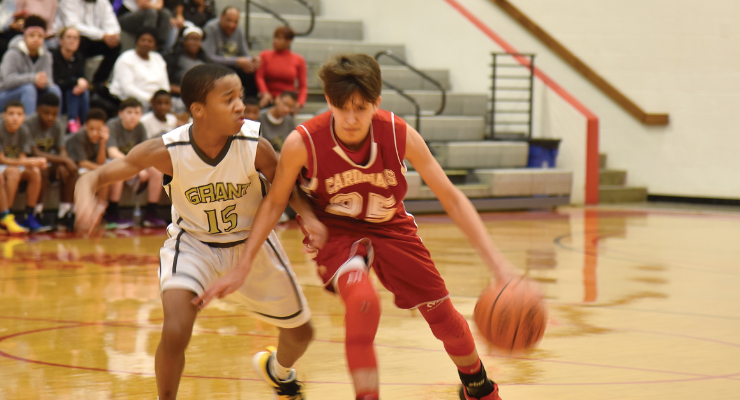 A long heave fell shy, and the Junior Cardinals found themselves the recipients of a hard fought 49-45 victory. Preston Long led the Junior Cardinal offense with 27 points, followed by Cord Tucker and Erik Healy with seven points each, while Joel Hortin added six points and Jaden Simmons two points. NCOE (24-1) advances to the SIJHSAA Class M State Tournament at Rend Lake College where they will take on Grant.